Night Court was always one of the forgotten sitcoms of the 80s. It was almost forgotten by its own network, NBC, as their bread and butter shows of the era were The Cosby Show and Family Ties. Still one of my personal favorites of all time, the show aired for a whopping nine seasons. The great current �it� sitcom, 30 Rock, even paid tribute to Night Court by staging a reunion of sorts that included a few of the main cast members. 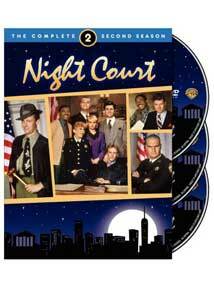 After a long delay between sets, Warner Home Video finally brings a second batch of episodes to DVD in the form of Night Court: The Complete Second Season set. The second season consisted of 22 episodes, beginning with The Nun, during which Harry (Harry Anderson) has enough of an impression on young Sister Sara Williams (Dinah Manoff) to make her consider leaving her order. Daddy for the Defense (a.k.a. Christine and Mac) features the debut of Public Defender Christine Sullivan (Markie Post). While she doesn�t become a full-time cast member until the third season, Post does a fine job here, giving us a glimpse of why she would become such an important part of the show. Billie and the Cat is a throw-away episode that also serves as a good indicator as to why the show�s producers decided to go with the Christine character instead of sticking with Billie Young (Ellen Foley) as the public defender, as Post proved to be a much better fit for such a role. Pick a Number is a basic morality tale involving a winning lottery ticket, while The Computer Kid gives us a nice look back at what technology was like in the 80s. Bull Gets a Kid went a long way towards first endearing us to the Bull Shannon (Richard Moll) character, but that�s followed by three Harry-centric episodes in Harry on Trial, Harry and the Madam, and Inside Harry Stone. In The Blizzard, the great John Larroquette is hilarious as Dan Fielding finds himself stuck in an elevator with a man who is attracted to him. Take My Wife, Please focuses on Mac�s (Charles Robinson) marriage to his Vietnamese friend, Quon Le (Denice Kumagai), who is threatened with deportation. Things get a little hot between Billie and Harry in The Birthday Visit, which is followed by more great Dan Fielding moments in Dan�s Parents. Next, we find a group of mental patients looking for Harry�s help in Nuts About Harry, while Selma (Selma Diamond) dominates An Old Flame. This episode is a great showcase for Diamond�s subtle comedic talents, but it�s bittersweet given that she died of lung cancer in 1985. A couple of great Biff-isodes come our way next, as The Gypsy and Battling Bailiff are two of the funniest shows of the season. Unfortunately, the next show, Billie�s Valentine, is one of the season�s few downers, but things are back on track next with Married Alive. In this episode, Dan uses his reputation to his advantage when he learns that his latest date is about to inherit a fortune. The title pretty much says it all about the next installment, Mac and Quon Le: Together Again, and World War III features an appearance by Russian comedian Yakov Smirnoff. The season finale, Walk, Don�t Wheel, isn�t as �important� as most season enders, but it does tell a funny tale of Harry and a disabled law student. Image Transfer Review: All of the shows appear in their original full frame format, and they look about as good as can be expected given the age of the source material. Images aren�t very sharp or detailed, but colors are strong and it appears that at least a little bit of an effort was made to clean up as much dirt and grain as possible. Audio Transfer Review: The audio is also far from special, but I expected worse. The show is almost entirely dialogue-driven, and thankfully, the actors� speech is always crisp and clear. Extras Review: There aren�t any extras. It�s beyond great to see Warner Home Video finally get back on track with one of the most underrated TV shows of the '80s. With their release of Night Court: The Complete Second Season, there�s hope that sets for the other seven seasons of the show will show up on store shelves very soon. While the audio and video quality are as good as we can expect from such an old show, it�s a shame that we don�t get any extra features at all.